It's all thanks to a Chrome extension from The Washington Post. President-elect Donald Trump is an active Twitter user and has over 17.4 million followers. Those are facts. The contents of his tweets usually aren't. Or they aren't whole truths. As a way of fact checking our nation's next leader's online musings, The Washington Post created a Chrome extension that does just that. Called "RealDonaldContext," it takes his 140-character thoughts and, as the name suggests, gives context to what he's saying. For example, in the tweet above he made a few disparaging remarks about Vanity Fair. If someone hasn't been paying attention to the internet over the past few days, they might not know what prompted the remarks. 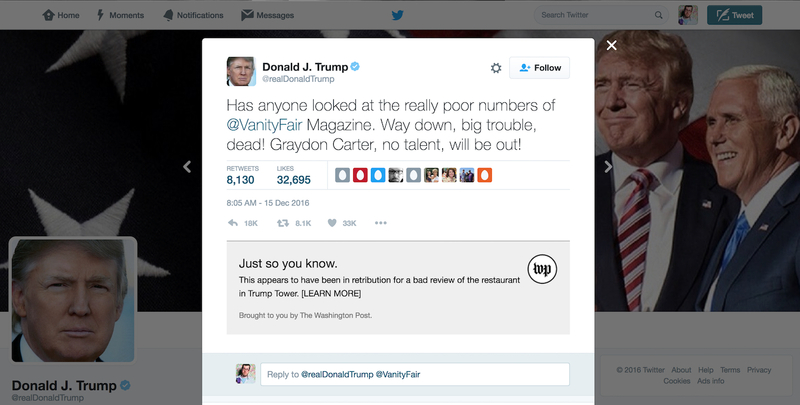 RealDonaldContext offers a solution, explaining that "this appears to have been in retribution for a bad review of the restaurant in Trump Tower" with a link to the review itself. In the instance of Trump's claim that Democratic presidential candidate Hillary Clinton "illegally" was given questions ahead of the second debate this fall, the extension gives a short explanation that the tweet is "incorrect or false." From there is a summary of why, with a link back to WaPo's story about the situation. The publication admits that the extension still needs a bit of work and that fact-checks can take a few minutes, but it's going to work on trying to stay up to speed. It's handy, sure, but at the least you'll have to follow Trump or hit his profile page to actually see the extension in action. In my testing, the fact checking only works on a tweet's permalink, and even then, only if you refresh the link. So, this could be a short-lived experiment for a lot of folks. The other view is that this is preaching to the converted. After all, why would a Trump supporter follow an account that actively debunks what the President-elect is saying?